Online Music Store How To Enable Safe Search in Google, Bing, Yahoo, AOL and Yandex? The internet is a massive source of information thanks to technology. However, not all content on the web is relevant to everyone. Kids are using computers and the internet in schools,and if not properly supervised, it can be dangerous for children. This is one reason why parents should be concerned with what their children are doing online all the time. As a parent, you must bring up your child in the best way. It is therefore vital to ensure your children are not subjected to adult content when they are young. Let them have access to the right material and even if they still want to search for it on the internet using search engines, make sure they can’t, and it’s limited. Search engines are used to search for whatever you want on the internet,and they include, Google, Yahoo, Bing, AOL, Yandex Search among many others. So how do you as a parent make sure the kids are searching for age-relevant content and not adult content? Google is the most popular search engine on the internet right now. By visitors to this website, 90% or more got here from Google. So how do you ensure a “child-friendly” searching environment for your children? •	Go to Google search page and search for something (anything). On the search results, you will see a gear icon to the right. •	When the page opens, you will see a Filter Explicit Results options,and you should put a checkmark next to it. Scroll down to the bottom of the page and click save. It is that easy. However, if your kids are sharp, they can still use the same method and search how to turn off safe search. This is why it’s necessary to lock this option such that a password will be required to turn it off. 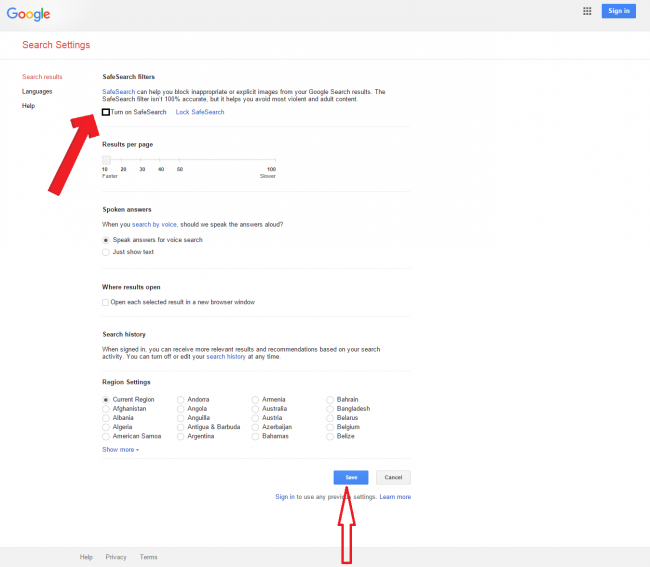 If you have a Google account, you can lock the settings to this options,and the kids won’t be able to remove the filter. •	Once you log in, click on Lock Safe Search and Google will automatically start locking safe search in all Google domains. The progress is seen on the screen, and you will get a confirmation once it reaches 100%. Being the second most used search engine, filtering adult content might be the best decision you made for your family. –	Go to Bing and click on the three horizontal lines in the upper right side of the screen for preferences. –	On this preferences page, there are Safe Search filtering options Moderate, Strict and Off. Change the filtering from Moderate to Strict. –	Scroll to the bottom of the page and Save and this will return you to the Bing homepage. Yahoo is one of the longest reigning search engines,and it ruled back then before Google existed. It has decent kid’s sites making it appropriate for the young ones. 1. Open the Yahoo home page, Sign into you Yahoo account and enter a search item then click Search. 2. On the right side of the search results page, click the Options link and select Preferences. 3. Once it opens, go to the Safe Search section of the page and click Edit. You can lock the safe search settings if you have a Yahoo account by just checking the box to lock the setting. America Online is another search engine,butit’s not so popular as compared to the ones previously discussed. i. Open the AOL Search page. ii. Enter a Search Term, after the Results load, click on Safe Search just below the Search Box. iii. In the Safe Search section, select the filter preference you want. There are three (Strict, Mild and Off). iv. Click Ok to save. 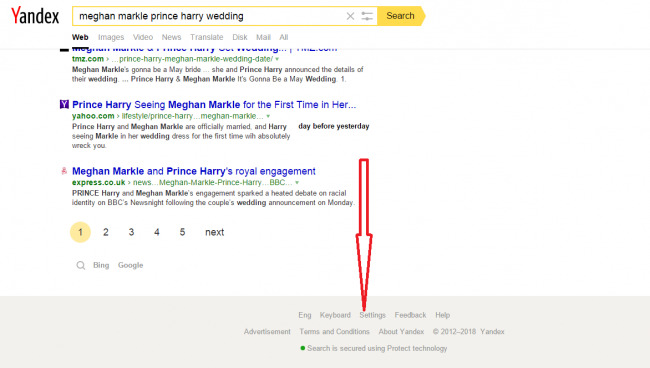 The Yandex search engine is one of the easiest to customize and safe for whole family use. 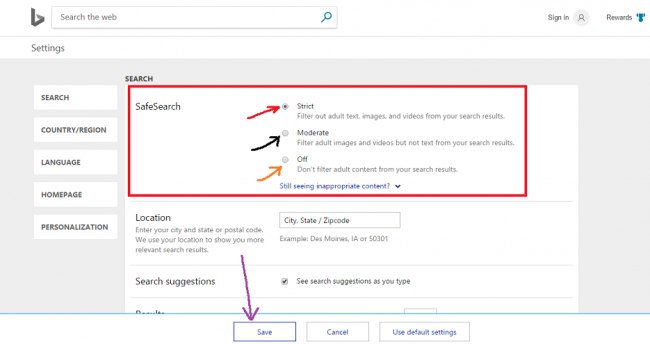 To filter adult content from Yandex search results, you need to enable the family search option. 1. Sign into your Yandex account, open the Yandex Search page and enter a Search term. 3. 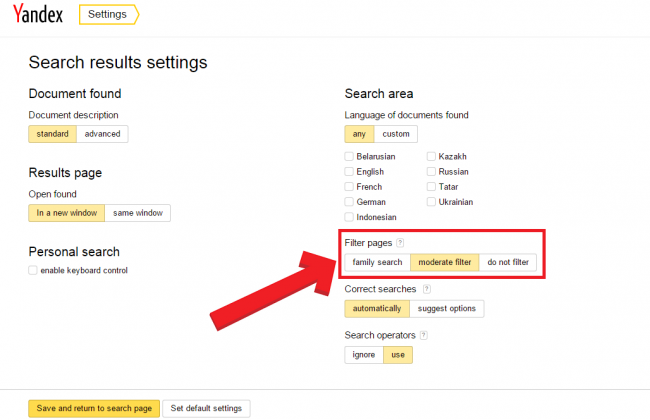 In the Filter Pages section (as shown in the image), you will see three options 1.family search 2. moderate filter 3. do not filter. 4. Select family search and then click on Save. Remember if you have a computer with multiple browsers, you will have to do this on every browser. If you have different user accounts on your PC, the same applies.